I made these little goodies for my wine club members along with several other items. They were a huge hit! I've had special requests to make them as Valentine's gifts, too. If you've never had fresh chocolate truffles, you owe it to yourself to try these. Just wait until the chocolate is very firm and dust your palms with cocoa powder to make rolling them easier. I'll be making these again for a Christmas this week! 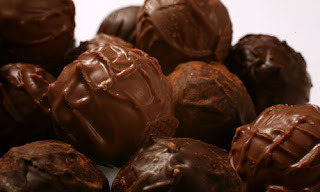 about 1 cup unsweetened cocoa powder for coating truffles or dip in sugar strands.